The United States is a politically divided nation. These divisions have only grown deeper in the past decade. They are increasingly paralyzing our democratic institutions, which rely on cooperation and compromise to function. They are threatening to tear our country apart. Divided societies have survived as democracies. But to do so, divided societies require careful attention to the design of their political institutions. For too long, political reformers have attended to the downstream consequences of division, trying to bridge ever-widening political divides by getting political elites to build relationships and work together across party lines. This paper argues that these efforts may be futile. Instead, we need to attend to the institutional choices that are exacerbating these divides. We may not heal the divisions overnight. But to the extent they exist, we can manage them. Scholarship on managing divided societies through democratic structures leads to three basic institutional recommendations: a weak executive, a strong legislature elected through proportional representation, and a high degree of federalism. Unfortunately, the U.S. only has one of these features: federalism. 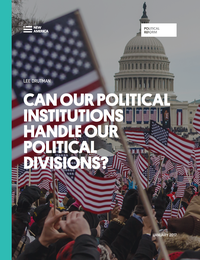 This paper briefly covers each of these three topics, assessing the ways in which our political institutions exacerbate our political divides, and how they could instead mitigate and diffuse our divides. The recommendation is straightforward. We need to shift the institutional balance of power — away from the executive, and towards the legislature and state and local government, to the greatest extent possible. Fortunately, our existing Constitution allows us to make the necessary changes. It is more a matter of political understanding and political will. The case for more federalism is pretty straightforward, and in some ways may even be inevitable. If Washington can’t and won’t act, states and cities will. This is already happening on many issues, perhaps most prominently on minimum wage. And now that Democrats are out of power in Washington, they will likely turn their energy and firepower to the states and cities where they can act. Weakening the executive and moving towards a more multi-party legislature are much harder, though not impossible. Here, it’s worth noting that in James Madison’s original constitutional design, known as the “Virginia Plan,” the legislature would have directly selected the executive. The Electoral College emerged as a compromise. But the Electoral College’s original purpose was merely to nominate candidates to the legislature. The founders expected regional candidates to emerge, but none with a majority of electors, leaving the Congress to decide. Madison had to give up some of his plan to achieve a compromise, but he still got a legislature as the first branch, and with most of the Constitution’s enumerated powers. And for most of the nineteenth century, Congress was truly the first branch of government. It wasn’t until the twentieth century that Congress began to delegate its authority away to the executive branch. Particularly over the last four decades, the legislature has steadily eroded its own power by failing to invest in its own capacity, letting the executive branch become more and more powerful. A legislative revival would take a significant decision by Congress to invest in its own capacity: hiring to compete with the executive branch and reinvigorating a committee system that has largely atrophied, as more and more power has shifted to party leaders in Congress and as committees have lost their independence. Events may play a role. If the Trump administration turns out to be the disaster many expect, Congress may need to fill a void. Congress is certainly overdue to invest in itself. Moving away from the winner-take-all system for congressional elections and towards a more proportional system would also be a political challenge. But again, it’s well within the bounds of the Constitution. In an earlier time, many states used multi-member districts to select representatives, and could do so again. Combining multi-member districts and ranked-choice voting would be an excellent choice. A very good plan along these lines is FairVote’s Fair Representation Act. It’s also possible that by weakening national parties and strengthening local parties, the U.S. could move back toward parties of loose coalitions with multiple factions, which created more opportunities for cross-party bargaining within Congress, and thus a less polarized and more effective Congress. This seems more likely to emerge if we move further toward federalism, which would make politics more local. All of these changes would invigorate civil society. More parties and more power at the local level would give citizens more opportunities to meaningfully participate, and generally increase a broad sense of civic efficacy. Rather than seeing politics as something that happens far away in Washington with only a few major leaders, citizens can learn that politics also happens closer to home, and that there are more than just two partisan ways to approach public problems. 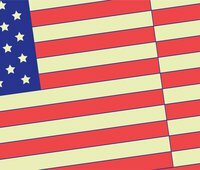 Can American democracy survive? It can. But it’s going to have to evolve to adapt to the stresses that it faces. The U.S. is now a much more divided and diverse society than it used to be. And we are now divided on many identity issues that do not provide space for compromise, and instead push us toward zero-sum thinking. Certain institutional arrangements worked reasonably well when the party system was more internally diverse and there were more cross-cutting issues that created opportunities for bargaining and compromise. Certain institutional arrangements worked reasonably well when the party system was less organized around divisive issues of what it means to be an American. These conditions are with us for the time being. They are the product of decades of social and political forces, and we cannot simply wish them away. We must manage and perhaps eventually diffuse them. Democratic institutions are central to this challenge. Certain institutional designs can worsen existing divisions. In particular, other countries’ experiences points to one major warning sign: A strong executive atop a powerful central government is not a good thing for divided societies. Whatever efforts have been made toward making our politics less divisive over the last decade have not worked. So it’s time to think a little differently. The divisions are real, and deep. Many of them involve zero-sum ideological differences, and clashes over fundamental values. If they become the central fights of our politics, they will tear our nation apart. A pessimist might stipulate that the only reason American democracy worked well in the post-World War II decades was because: 1) the Cold War gave us a common enemy and emphasized a shared sense of what it meant to be an American; and 2) widely shared and sustained economic growth contributed to generally higher levels of political trust, since most things appeared to be working reasonably well. If so, this suggests the only way we can heal our political divisions would be to find a common enemy and/or deliver broad-based economic growth. Certainly, these factors contributed to harmonious politics. But to argue that our political institutions can only work under these conditions is to assume a position of helplessness for the present moment. An optimist might assume that the surely erratic and dangerous presidency of Donald Trump will spur a major bipartisan backlash, unifying the country around a new, shared consensus. Perhaps it will. But thus far, most Republicans have rallied to him. Partisanship is a powerful structuring force in politics. Even if a solidly majoritarian consensus emerges in response to Trump, the deep cultural and identity divisions will still exist. Redland and Blueland have very different visions over what it means to be an American—divisions that go beyond Donald Trump and Hillary Clinton. The challenge now is managing the divisions—not to hope they will magically disappear if we just get people talking to one other, somehow, or if people on the other side can finally “see the facts.” Fortunately, divided societies have been experimenting with how to do this for a long time. It’s time to pay attention to what their experiences tell us. Like all institutional choices, there are plenty of trade-offs in the recommendations here. No balance is perfect, and all institutional designs will surely produce unintended consequences that we will be dealing with at a future moment. But let us stipulate the following: First, there is no perfect solution to channeling the often conflicting demands of a nation of 320 million people within any political system. Second, the greatest challenge to our democracy is our deeply polarized two-party system, and the way its divisions coincide with geography and identity. If we do not solve this problem, our democracy may have no more problems left to resolve in the future. Though these are challenging times, we need not abandon all hope for a unified country. At some point, our party system will look different, and our politics may well be organized around new, less divisive fault lines. New foundations of consensus may emerge. But we need to get past this moment to figure out how.